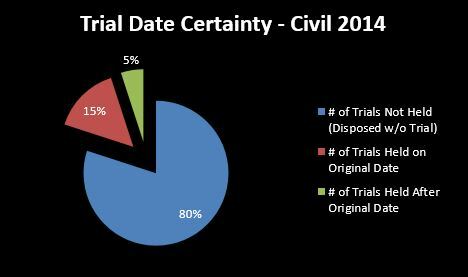 Definition: The number of times cases disposed of by trial are scheduled for trial. Purpose: Our Court’s ability to hold trials on the first day they are scheduled to be heard is closely associated with timely case disposition. This measure provides a tool to evaluate the effectiveness of calendaring and continuance practices. For the litigants, attorneys, witnesses and jurors who may be involved, scheduled trials that go forward on a predictable basis avoid the unnecessary expense, disruption, inconvenience, and stress associated with adjournments and delay.